An international seed vault will soon be built on the Norwegian island of Svalbard (Spitzberg) to preserve all the seeds of food crops worldwide. It has been designed to withstand a global climatic catastrophe and will allow the retrieval of all major agricultural plants should they be lost. 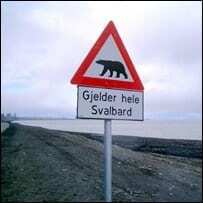 As this island has been dubbed “polar bear country”, the seeds will be well guarded! The Norwegian government has revealed the architectural design for the Svalbard International Seed Vault, to be carved deep into frozen rock on an island not far from the North Pole. The entrance to the “fail-safe” seed vault will “gleam like a gem in the midnight sun,” signaling a priceless treasure within: seed samples of nearly every food crop of every country. The vault is designed to protect the agricultural heritage of humankind — the seeds essential to agriculture of every nation.